Moms are possibly the busiest people on earth. From the moment their eyes open until the moment they drift off to sleep, their days are filled with a million and one chores. One of the most important daily tasks a mother must face is feeding her family healthy and delicious foods. For moms on the go and moms who aren’t super savvy in the kitchen, here are two tasty dishes that are easy to make and wonderful to eat. They both make superb leftovers too! These chicken fillets have half the calories and fat of their fried counterparts. Kids love them and parents are grateful for them. Pair them with either a quickly steamed vegetable side dish or serve them alone. 2. Set up an assembly line consisting of a plate of raw chicken, a bowl of three whisked eggs, a plate full of bread crumbs and a lightly greased cooking pan. 3. If you are working with whole chicken breasts, cut them into small fillets or chicken nuggets. 4. Dip the chicken first in the egg and be sure the chicken is fully coated in egg. 5. Dip the chicken into the breadcrumbs until the chicken is fully covered. 7. Bake chicken for twenty five to thirty minutes. Allow to cool for ten minutes. Sprinkle with lemon if desired. Macaroni and cheese is a kid’s favorite. However, boxed macaroni and cheese is neither delicious nor nutritious. 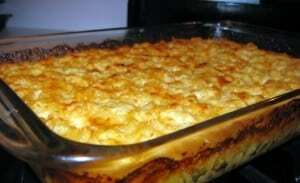 This homemade macaroni and cheese, however, is nutritiously delicious and the epitome of all comfort foods. 1. Preheat oven to 350 Fahrenheit degrees. 2. Thoroughly cook macaroni and drain. 3. Rinse macaroni under warm water to rinse off the starch. 4. In a large bowl, melt butter into the macaroni and stir until butter is spread throughout the pasta. 5. In the glass cooking pan, spread half of the pasta out and cover with one cup of cheddar cheese. Cut Velveeta cheese into chunks and place on top of this layer in an even manner. 6. Cover that layer with another layer of pasta and then top that layer with the other cup of cheddar cheese. Place desired amount of Velveeta chunks on this layer. Use your own judgment as to how much Velveeta you use. 7. Sprinkle breadcrumbs over the entire top of the macaroni. 8. Cook for thirty minutes. It is finished cooking when cheese is fully melted and the top is golden brown.